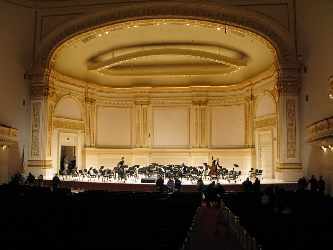 The fifth season of Carnegie Hall Live! features some of the world’s best performers and ensembles in a wide range of styles, from early music to solo recitals to orchestral performances. The season kicks off with the Opening Night Gala concert by the New York Philharmonic, conducted by Alan Gilbert and featuring guest soloist Evgeny Kissin in a rousing performance of Tchaikovsky’s Piano Concerto No. 1 in B-flat Minor, Op. 23. Other highlights in the specially-curated series include concerts by the Vienna Philharmonic and Berliner Philharmoniker; recitals by stars such as tenor Jonas Kaufmann and pianist Yuja Wang; and the St. Lawrence String Quartet performing the New York premiere of a new work by John Adams. Carnegie Hall Live is hosted by WQXR’s Jeff Spurgeon, and is joined by various co-hosts from the arts and media world including Christine Goerke, Susan Graham, Anthony McGill, John Hockenberry, John Schaefer, and Deborah Voigt, among others.